The campaign is held together with the Uklon tax service under the #wartaxi hashtag. Volunteers and veterans have found an unusual way to raise money to buy an SUV for antiterrorist operation (ATO) troops. "Today Uklon and the Back and Alive foundation are launching a unique campaign. 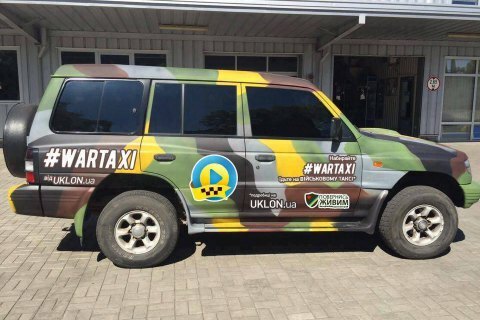 If you order a taxi using the [Uklon] mobile app and type #wartaxi in the comments section, Uklon will transfer the cost of your trip (driver's tips not included) towards the purchase of an SUV for the 30th detached mechanised brigade of the Ukrainian Armed Forces," Back and Alive founder Vitaliy Deynega has said. During the campaign, which is expected to last until 22 September or until the moment the full amount required for the purchase of an SUV (125,000 hryvnyas or about 4,850 dollars) is collected, ATO volunteers and veterans will answer passengers' questions about the war and volunteer activities. Deynega added that Uklon donates large sums for the ATO needs. "We decided to hold a joint campaign to let passengers know that by using this service they automatically help the Ukrainian army," he said. Leonid Ostaltsev, a veteran of the 30th brigade and founder of Kyiv's Pizza Veterano, said: "The sector protected by the 30th mechanised brigade is 72 km long. There are long distances between the strongpoints. You cannot use an infantry fighting vehicle because it is noise and also because they need to be at strongpoints. There are no vehicles to bring water, ammunition or rotate the personnel. Therefore cars also offer a mobile solution and are used to evacuate the wounded." Uklon said it was planning to run the WarTaxi campaign in Odesa, Lviv, Dnipro and Kharkiv in addition to Kyiv. Join the campaign! Use the #wartaxi hashtag when you order a taxi with Uklon.